Happy Monday! I'm joining the Little Red House again for Mosaic Monday...Mary has beautiful photos on her blog. I really like how she makes a mosaic with a pattern that compliments her photos. I think I need to try that. 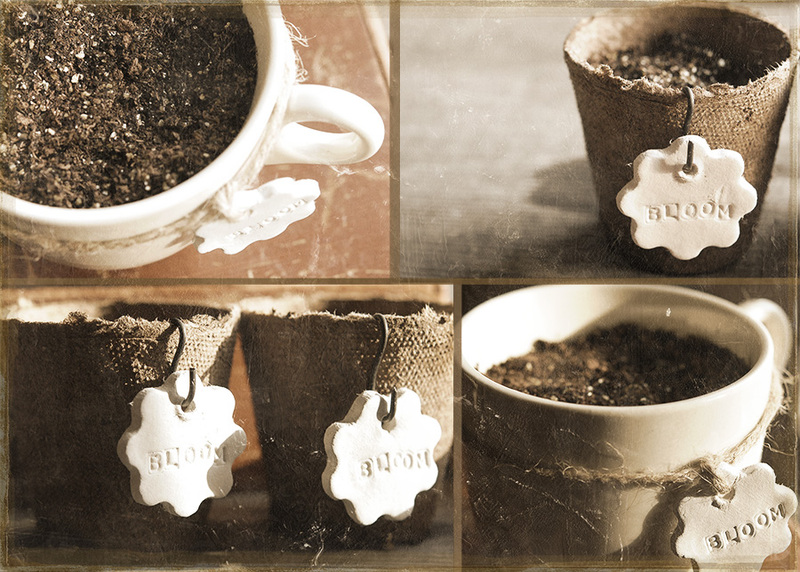 These clay tags I made, along with the coffee cup planters, will be available at Simply Bungalow this weekend. I have Rosemary planted in my cups and cockscomb, hyacinth bean vines, black eyed susan vines in the peat pots...now grow and bloom please! It's been years since I've tried to start seeds inside. I think peat pots need to be brought indoors and used in decor somehow, they are so neat. I've had these out in the barn for over 12 years. It's time to use them. (There are more.) Maybe they could be used to organize little whatnots or torn up to use in a collage. Have any of you used peat pots in a project? I, too, love mosaics. Need to make another one soon. Yes, I have painted peat pots with white gesso, and glued crepe paper that I bleached and gathered into a ruffle along the top. Also put a wire handle on. Fill with anything!!! Fun mosaic. Peat pots have a lot of potential - for growing things and for decorating, I agree. Your clay tags are sweet. Too cute Jill! I think I'm going to drive down to Lincoln on Friday to check out this new shop. 'My kind' of store are too few not to support. Are you going to be there too? And not to be too greedy - how about a tutorial on your clay tags? Wow. Great trailer and great pots! I love the clay tags! They look likegood luck charms ..... bloom! Darn it! Love the mosaic. And the jute on the cups is very cute! I love peat pots too....my late father was a gardener-extraordinaire...a whole section of our basement was filled with grow lights and peat pots filled with seedlings that eventually landed in his gardens. http://the-featherednest.blogspot.com and http://karlascottage.typepad.com both have made some darling peat pot creations in the past. i love peat pots....although i would have called them 'you know, those little pots gardeners use to grow seeds and stuff'...i like peat pots better. Another who just showed what she did with her peat pots is http://www.thecrankyqueen.blogspot.com We had "craft night" and played with them. Hers actually turned out cute. Mine, not so much. But I'm working on some more and will have a post on them probably some time this week. maybe I shouldn't be sharing that part? Your tags are simple, understated and PERFECT! So you have a kiln? I was going to mention peat pot Easter baskets, but Linda already mentioned them-- she probably sent me the link! Loving those too precious clay tags! Miss my clay adventures since retiring...we had a kiln at our school and had many great adventures with it! Love the clean, simple lines of your little teapots!